April 26, 2014 by Dreamz Unlimited! Sajid-Wajid is riding high on the success of their latest album Main Tera Hero. They yearned for a successful album and finally they got one. 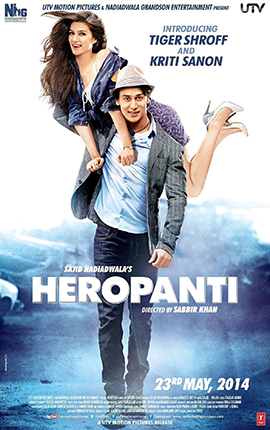 Heropanti can act as a driving force in their current form as the movie is already highlighted because of Tiger Shroff’s debut, the son of Jackie Shroff. The moment I heard the name of the movie, I doubted if the songs would be having any creativity. And I think my doubt was in the right direction. A quite unusual thing has happened with this album. One song Whistle Baja Ke has been released by Saregama as it has its old famous tune from Hero. The rest of the soundtrack is by T Series. Sajid-Wajid have 3 tracks, one is by Mustafa Zahid and Bilal Saad and the remaining one is by Manjeet Ral. An unusual arrangement for Sajid-Wajid where they overlaid the basic tune of Mukhasar and filled it with techno sounds. These kind of experiments are always welcome regarding the condition that the tune should be melodious and attractive. The problem is with the basic tune of Mukhtasar as that was itself a very staid composition and when you insert low frequency techno sounds in that, it gets even worse. Comparing to Mukhtasar, the only alleviation here is Arijit replacing Wajid. Arijit seems to have sung purposely in a tedious way creating an unimpressive impact. Shreya Ghoshal is the only charm here who gives the track the much needed dazzle. Lyrics is not anywhere near the level of Mukhtasar. A good attempt seemed vague at places. So Mohit is again behind the mic with another romantic but sad song. No, finally it doesn’t resemble to any of Sajid-Wajid’s previous work. It sounds like a song belonging to Vishesh Films. It has that Bhatt essence in it which provides a kind of aggressiveness in romance. Lyrics has been created with a particular set in mind and that makes it quite predictable. Mohit Chauhan’s singing covers up all the flaws. His vocals suit perfectly and help the song to be driven a long way by the listeners. Nothing to boast about but still deserve a listen. Here comes another intolerable composition in Bollywood music. This Manjeet Ral and Raftaar combo is a dreadful one. A very unorganized way of doing the arrangements and use of techno sounds. The lyrics by Raftaar is probably one of the worst lyrics ever. Plus, that annoying sound of kiss, adds more cheapness. I wish they never compose anything in future, otherwise the listeners will have to suffer a lot. Basically there’s nothing to listen and like about. As awful as you can think of. It becomes vapid when the same old kind of stuff is being repeated again and again. Mustafa Zahid, in collaboration with Bilal Saad, has created a pleasant tune but it lacks freshness. The composition seems to have very minimal creativity. The Guitar rhythm is also a thing which we have heard in many romantic songs. They could have shown a little bit creativity either by providing some unique arrangements or by writing unconventional lyrics. A type of sad romantic song that we are very much acquainted with. This is a very unique track. No, not because of the the composition but because of the legal issues. Although the whole soundtrack is by T Series, this track is by Saregama and it released individually as a single and not as a part of the album. I don’t understand why Saregama has been so strict with these crediting related issues. The reason for Saregama retaining the rights with them is only that an old whistle tune that was a part of the old movie Hero, had Saregama as music label. Just because of that tune, the song rights retained with them and actually that’s the only tune in the song which still sounds enjoyable and refreshing. The stanzas are catchy but seem heard-before. The female singer Nindy Kaur is damn irritating with her vocals and the lyrics by Raftaar is worth avoiding. The old “Hero” tune steals the show and also goes well with the title of the film. A roadside romeo song. So, Heropanti is a monotonous soundtrack. Sajid-Wajid’s Rabba and Raat Bhar are just rebuilding of their old compositions. Tere Bina by Mustafa Zahid and Bilal Saad is just another sad stodgy composition. Saregama’s Whistle Baja Ke is a nice enjoyable track with few nuances. It is better to not to talk about The Pappi Song and Tabah could have been much better that it really is. Sajid-Wajid, Manjeet Ral and Mustafa Zahid have done a lot of hardwork in making this album dull, boring and repetitive. Raat Bhar is quite similar to Mukhtasar from Teri Meri Kahani. After all, it’s Sajid Wajid. Same composer. My favourite song is Rabba. Sad too see that ever since Arijit Singh arrived, Mohit is getting very less songs! Every Sajid-Wajid album has one terrific melodious romantic track. This one happens to be Rabba. Great Job by Sajid-Wajid, Mohit Chauhan & Kausar Munir. This ‘whistle song’ from Heropanti is really working for me. Something about it is working. Or maybe everything. Really liking Whistle Baja Ke.